Oil mystery: How close is Saudi Arabia to maxing out production? Mystery: How much more oil can the Saudis really pump? 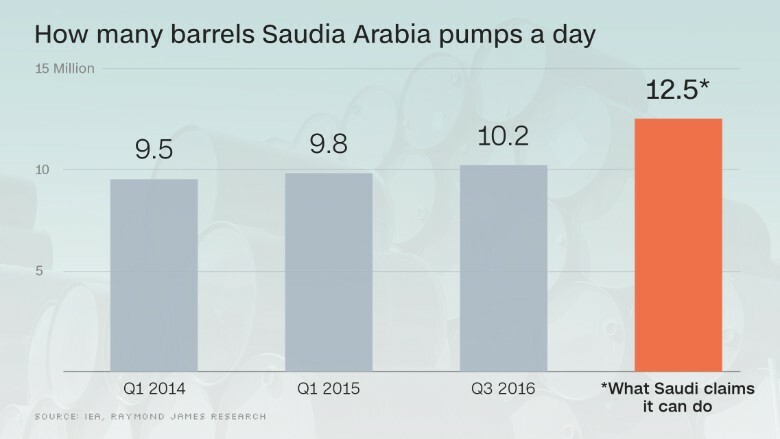 Saudi Arabia has long claimed it has the firepower to overwhelm the oil market by pumping tons more crude if it wanted to. The OPEC leader is already pumping ferociously as part of a price war aimed at recapturing market share lost to the U.S. and others. Saudi's daily oil production has surged from 9.5 million barrels in early 2014 to a near-record 10.2 million today. Saudi officials have stated the kingdom has the ability to ramp up output to an incredible 12.5 million barrels per day. But Saudi Arabia's oil industry is shrouded in a great deal of secrecy, leading to persistent skepticism about whether those claims should be trusted. "Is that number real, or is it propaganda?" analysts at Raymond James wrote in a report that noted the Saudi government's "nearly total lack of transparency." What is clear is that Saudi Arabia's "max-out" number is a big deal. If Saudi Arabia is near its production limit, that would mean the country has little room to respond to a sudden supply shock caused by any geopolitical situation or natural disaster globally (see: wildfires in Canada). On the other hand, if Saudi Arabia can truly ramp up production and chooses to do so, it could cut off the recent oil price rebound to around $50 a barrel. Mohammad Al Sabban, the former Saudi representative to OPEC until 2014, insists Saudi Arabia really has the ability to ramp up output to 12.5 million barrels a day. Yet Al Sabban told Raymond James that only half of those barrels would be available immediately within days or weeks. The rest could take up to six months. Raymond James thinks investors should take those claims with a grain of salt. "We don't buy the Saudi excess capacity argument," the firm wrote. 1.) Saudis already in uncharted territory: Except for "short one-month bursts," Raymond James notes that over the past 30 years, Saudi Arabia has never gone above the current pace of production. That's despite the existence of supply shocks like the Libyan production outages and Iranian sanctions. "If they truly have the capacity, why haven't they used it?" Raymond James asks. 2.) The unfired bazooka argument: The claim that Saudi Arabia could pump another 2 million barrels a day implies the kingdom is holding off on firing a huge weapon in the ongoing battle for market share. Raymond James doesn't think that strategy makes sense. "If Saudi really wanted to punish the competition, then producing all-out would crush the rest of the industry," the firm wrote. 3.) Saudi rig counts are surging: There is a camp in the oil industry that believes Saudi Arabia's oilfields have gotten so old that they aren't as productive as they once were. For instance, the Ghawar field -- the world's largest with an estimated 75 billion barrels of oil -- is over 60 years old. Skeptics point to the fact that rig counts in Saudi Arabia have tripled over the past decade -- even though output hasn't gone up nearly as much. At the same time, Saudi stockpiles of oil have declined by around 30 million barrels since October 2015. "If they only need to turn valves on to flood the market, why are Saudi oil inventories falling?" Raymond James asks. But concerns about Saudi's aging fields are offset by the country's deep experience in the oil industry. Saudi Aramco, the state-owned oil giant, claims it has the best reservoir management in the world. 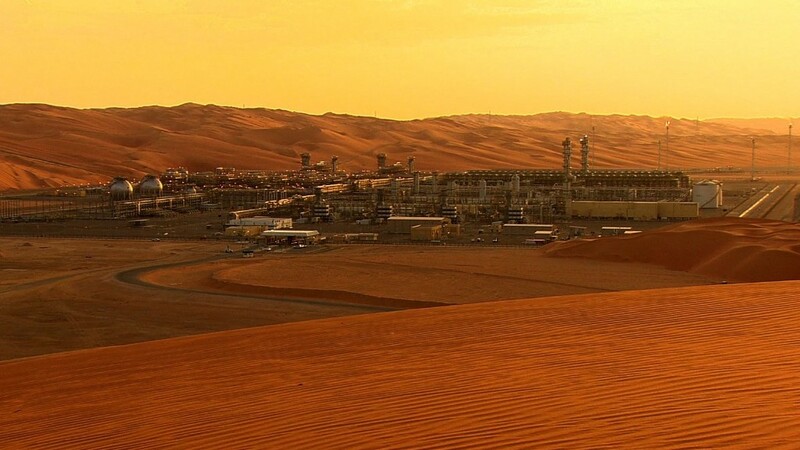 Aramco says it averages 55% in extraction from a field, well above the average of about 35%. "We've just scratched the surface here in the Shaybah" oil field, Mohammed Al-Qahtani, Aramco's senior vice president of upstream, recently told CNNMoney's John Defterios. "This is a frontier area. We have many other frontiers in the kingdom." Ultimately, there is no clear-cut way to solve the Saudi production mystery right now. "One doesn't know the true answer unless one is a member of the royal family," said Tom Kloza, global head of energy analysis at the Oil Price Information Service. The good news is that clarity could be coming. Going forward, Saudi Arabia's plan to sell a chunk of Aramco to global investors would likely force the kingdom to reveal some of its most closely-guarded secrets.